Having visited us at MBS, you might want to know more. If you'd like to connect with other spiritual seekers exploring the divine through nature, please click Forest Church. Below is a list of Forest Church groups, so you can see if there is one near you. Here is a link to find out more about Ruach cards. We're all getting ready for MBS 2016 at Olympia, starting on Friday. We'll be using Ruach cards, the Jesus deck and giving away free resources to help you on your spiritual journey. This year we have a 12 strong team who'll be looking for ways to bless and encourage you over the bank holiday. So if you've spent all your money and have tired feet, please do come and visit us on Stand B17. We'll look forward to seeing you there! Dekhomai have had a stand at the Mind, Body, Spirit Festival for 10 years, this Bank Holiday Weekend. If you're at Olympia, do come over and say hello and wish us happy birthday! We have a stand this week at the London mind body spirit festival. As ever we will be offering spirituality and resources from the Christian tradition. Come for healing prayer, ruach cards, Jesus deck cards, make a prayer cord, be listened to, and just relax in the midst of a busy life and festival. At the London mind body spirit festival running a stand once again. Come and meet us, have a Jesus deck reading, foot or hand massage, healing prayer or a blessing. All offered free as a gift. we are stand 43 - come and say hi! we are back this week at london mind body spirit festival offering spirituality from the christian tradition - listening, prayer, welcome, healing, foot and hand massage, prayer beads, jesus deck readings. come and say hi! Mysterious and alluring, labyrinths have been in use for over 4,000 years as a means of exploring one's spiritual journey, searching for meaning and guidance. The labyrinth is a unicursal or 'one-path' design - not like a maze, where there are decisions to be made and you can be tricked - but a path laid out before you, much like our own spiritual paths, to which we must surrender, following God's guidance. Christian labyrinths date back to the 4th century (in Algeria), although the most famous instances came later (e.g. Chartres in the 13th century). Recent years have seen a revival of interest in this practice as a powerful physical recreation of the inner life. 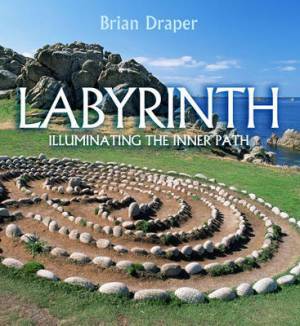 This small format hardback book - illustrated with labyrinths from different designs, locations and ages - is an inspiring, meditative guide to this ancient and modern spiritual practice. the set of dekhomai postcards for the london mind body spirit festival. on one side is a lovely image and on the reverse a spiritual exercise. lots of people are unsure how to pray - these cards offer some things to try that will help... come and pick them up on the stand where we will be giving them away free. Rob on we are stand 43 - come and say hi!